← 369 "The Seemingly Never-Ending Story"
A laser grid protects the couch. After sneaking past, Homer's head falls off. Bart has Two Mommies is the fourteenth episode of Season 17. "Marge babysits Rod and Todd, who are not allowed to do many things since Ned cares for them too much. 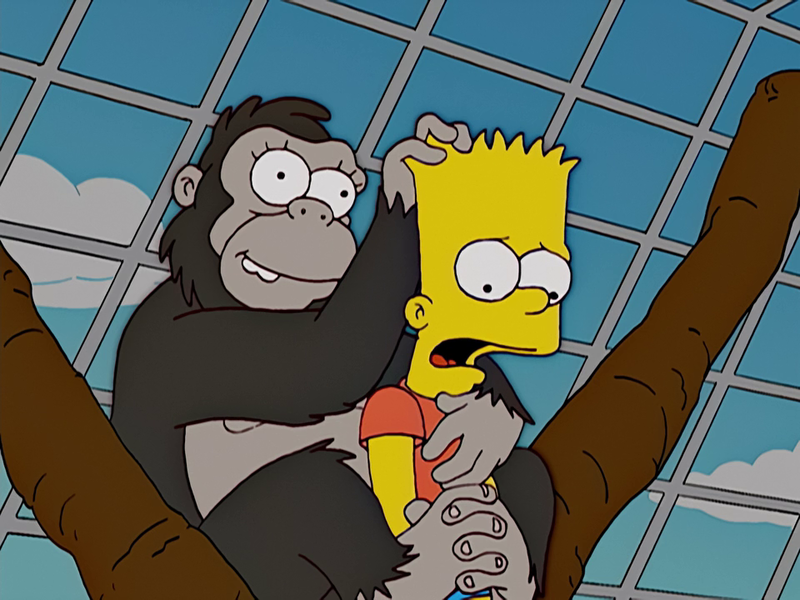 Homer takes the kids to an animal shelter, where Bart is kidnapped by a monkey." One day, the Simpsons attend a church fundraiser for a new steeple. In spite of Homer's best efforts to cheat, Ned Flanders wins a rubber duck racing contest and wins a female-oriented computer called FeMac. Ned gives the computer to Marge because Ned doesn't have any use for it. In return for the computer, Marge babysits Rod and Todd. With Marge spending so much time at the Flanders', Homer must look after Bart and Lisa. He spends most of the time sleeping and Bart and Lisa break many things, while jousting with their bikes as steeds. When Lisa insists, Homer takes the kids to an animal shelter for retired film animals. The trip goes awry when Toot-Toot the monkey pulls Bart into her cage and holds him hostage after Bart offers her a bit of his ice cream. Marge listens to Rod and Todd's prayers which include them having a wonderful day and forgiving Mrs. Simpson for eavesdropping on their prayers. Ned comes back home and sees his kids wearing Band-Aids, and tells them to crawl to their beds. Marge tells him that he should support some forms of adventuring and shows him a flier about an activity center with everything covered in foam. Ned agrees eventually after some thought. Homer fools Marge into not having to worry about Bart; Marge takes Rod and Todd to the children's activity center to encourage their spirit. 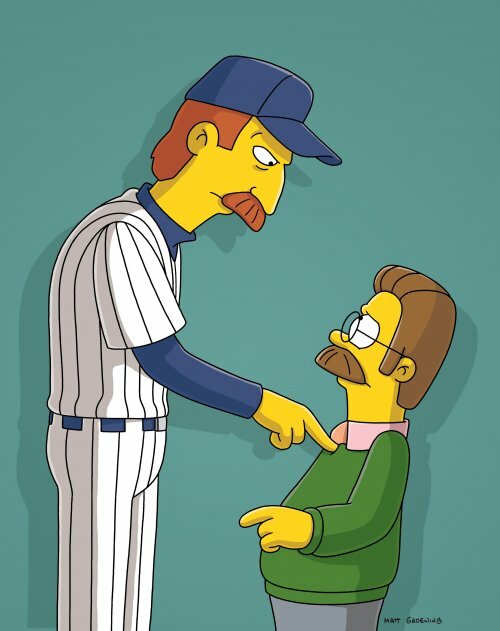 Ned secretly spies on them and overreacts to Rod's minor injury of a chipped tooth, for which reason Ned bans Marge from babysitting Todd and Rod. Marge learns of Bart's kidnapping via a breaking news report from a small television set hanging from the roof of the centre. Toot Toot and Bart end up on the top of the Church's unbuilt steeple much like King Kong on the Empire State Building. Reverend Lovejoy makes Marge cry when he indicates he is willing to name the steeple in memory of Bart. At the credits, Ned glares at Marge, but Maude, shown to be in Heaven, looks on, proud that Rod is growing up. Modified on March 29, 2018, at 08:13.